Moorestown will once again be celebrating local businesses as well as its residents and visitors with the annual Moorestown Day. Thousands of people will descend on Main Street on Saturday, June 4 as the town celebrates its 40th Moorestown Day from 9 a.m. to 4 p.m. For its 40th annual festival, the Moorestown Business Association is planning a “3D-Day” with delicious food, delightful entertainment and down home fun for all. Residents are also encouraged to visit the Annual District Art Show at the Recreation Center, where art made by residents will be on display. “The objective of Moorestown Day is two-fold: to give the opportunity for members of the MBA and other businesses to present themselves so they can reach out to the public and let people know that they are there; and we hold it as a street fair for people to enjoy,” MBA President Don Powell said. “All residents are encouraged to come out and visit the (art show at the) Recreation Center on Moorestown Day as well as visit the downtown area,” Sustainable Moorestown President Wolf Skacel said. More than 300 merchants and vendors will line Moorestown’s historic thoroughfare. In addition to the food court, families can enjoy entertainment in the Kids’ Zone located near the Chester Avenue end of Main Street. The Kids’ Zone will feature giant inflatables and other fun games, a petting zoo, camel rides, face painters, a balloon artist and the ever-popular stilt walker. “My favorite part I think is probably the kids section. We have many different attractions for the kids,” Powell said. Once again, The Pie Lady Café will host the very popular Pie Eating Contest. Sign ups for this event will take place at the café. Also on Saturday, the Third Floor of the Church Street Recreation Center, located in the municipal complex between Second and Third streets, will open its doors to host the Annual District Art Show, sponsored by MoorArts. This annual showcase features the artistic talents of K-12 students in Moorestown Township Public Schools. 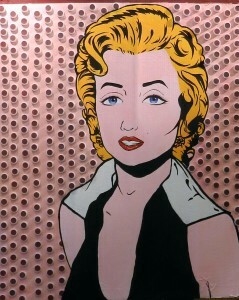 Admission to the show is free, and light refreshments are available to all who attend. There also will be free children’s face painting and free crafts. Additionally this year, the District Art Show will feature the 2016 Upcycling Art Challenge, sponsored by the Sustainable Moorestown and Moorestown Creates! committees. This challenge presented to Moorestown High School students will feature upcycling of materials to create unique and interesting projects. “The challenge was conceived … as a way to draw attention to the fact that plastic caps and lids are not recyclable and are considered a contaminant in the recycling stream … So if they are supposed to be thrown in the trash, is there another potential use for them instead of the trashcan? That’s what Upcycling is about. It’s about finding another use for something that would ordinarily be thrown away. Art creates an opportunity to think outside of the box, to be innovative and explore the use of materials such as lids and caps in new ways,” Skacel said. 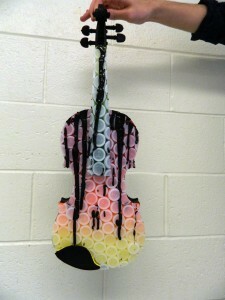 Moorestown students were challenged to incorporate lids and bottle caps into their art as a way to reuse the items, but also make people aware these items are pollutants, and upcycling of these items helps the earth. Students took to the challenge, also using other materials that could be considered trash, such as aluminum cans, discarded instruments and cardboard. “There is no doubt our community members will be impressed by the creativity, skill and hard work the students put forth to achieve their goals in such an outstanding way,” MHS art teacher Toni Paparone said. 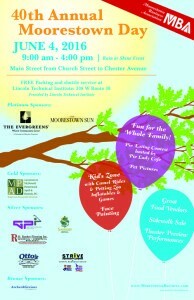 There are many exciting things happening at Moorestown Day, so all are encouraged to come, rain or shine. “People should come out and enjoy a day of festivities, family fun and community,” Moorestown Day chair Helen Davies-Miramontes said. Lincoln Technical Institute is providing free parking and a free shuttle service throughout the day. Follow the signs to park in its large lot at 308 W. Route 38, or enter from Harper Drive, and look for the Lincoln Technical Institute buses. The shuttle will drop you and your family off at Main Street. Again this year, Moorestown Day will be held on the same day as the 32nd Annual Scott Coffee Memorial Rotary 8K Run, which starts at 8:30 a.m. in front of the Moorestown Community House. Boasting nearly 1,000 participants, the run adds to the festive atmosphere of the day. For more information about the run, visit www.runningintheusa.com/moorestown.